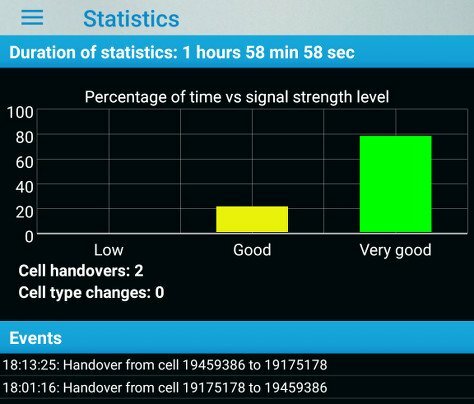 Phone signal allows you to check your cell phone signal quality in detail (signal strength, handovers, and radio type changes) over time and view network cell information. Navigate between the main screens by swiping left or right, or by using the navigation drawer (top left). Provides an overview of SIM, network and signal strength (up to 1 minute). The signal graph is color-coded to represent signal level (green, yellow, red). Cell handovers (handoffs) are shown with vertical orange bars. Cell radio technology changes (e.g. 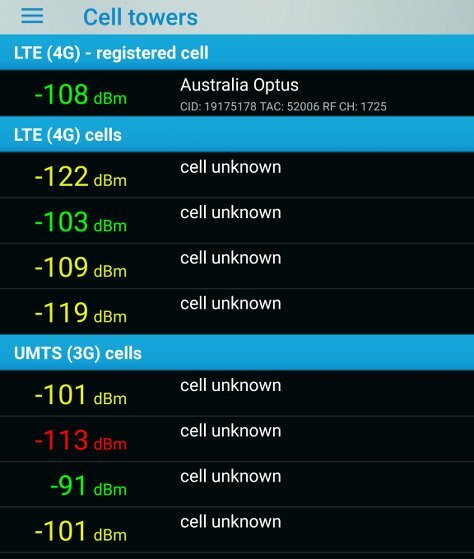 LTE 4G to UMTS 3G) are shown with blue vertical bars. The graph shows time on the horizontal axis and signal strength (in dBm, or power ratio in decibels) on the vertical axis. -110dBm (minus 110) is a stronger signal than -120dBm. The color coding shows the signal level. The signal level is mainly relative to signal strength and radio type, but can also incorporate the signal to noise ratio (e.g. when the background interference is relatively high compared to the signal strength). Clicking on the graph data series will open the full-screen signal graph. Where available on dual SIM phones the second signal is graphed with a much thinner line. 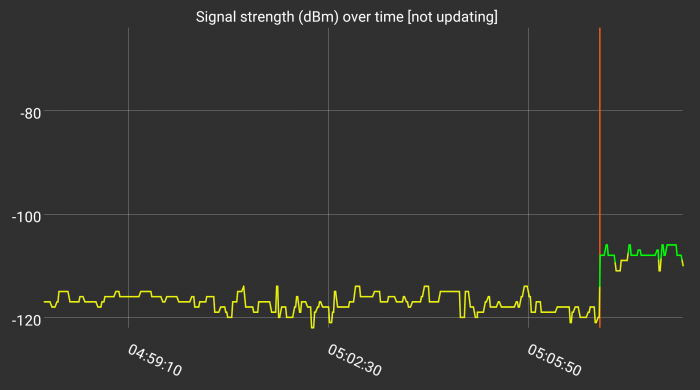 Shows a detailed signal strength graph with data since andSignal was started (up to 60 minutes). Scrollable and pinch-zoomable. 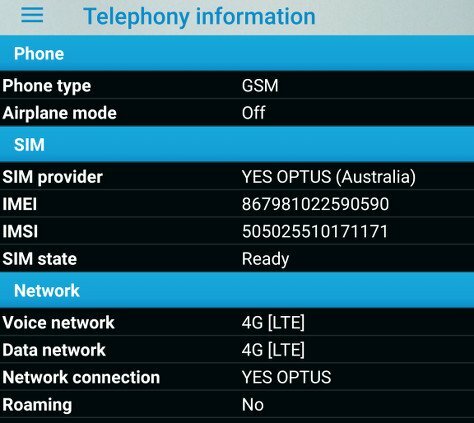 Shows an overview of the current phone, SIM, and network information. Airplane mode suspends radio-frequency signal transmission. A smartphone needs a unique identity to use a cellular network. A SIM (Subscriber Identity Module) securely stores this identity (the IMSI: International Mobile Subscriber Identity). There are a number of common network types. 4G LTE is currently the newest and fastest, 3G being slower and 2G much slower again. If your data network connection is 2G or 3G you will typically notice much slower data download speeds than if you are connected to 4G. The cellular network is a communications network where a cell phone wirelessly connects using radio waves. The geographic area is divided into cells with each cell tower using a certain frequency (band). Neighboring cells use different frequencies to reduce radio interference. A cell phone registers to a cell, but constantly checks for nearby (detected) cell tower signals and uses this information (such as nearby cell tower signal strength and interference) to determine whether the phone should change to a cell tower with a better signal. The Cell towers page shows the nearby cells detected. The cells the phone is registered with are shown at the top of the screen. Where available, the signal strength and cell network provider are shown, along with the cell identification information for that radio type (e.g. for LTE 4G, the Cell ID, Tracking Area Code and RF channel). The other detected cells are shown grouped based on their radio type (e.g. LTE 4G). Typically less information is available for cells the phone is not registered with (and this is shown as “cell unknown”). 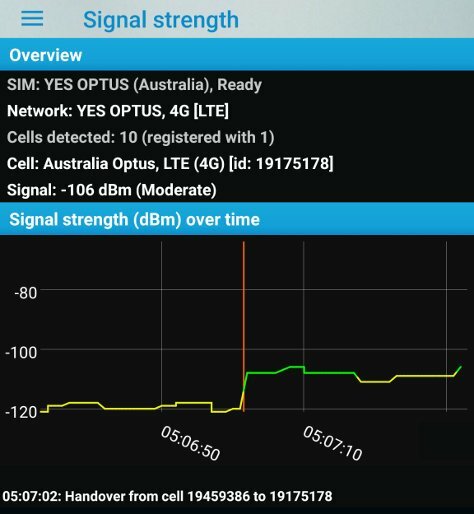 Shows the percentage of time the signal level has been low, good or very good. Shows the number of cell handovers and type changes (e.g. LTE 4G to UMTS 3G). Shows a list of significant events, including cell handovers, cell type changes and signal strength dropping to low.